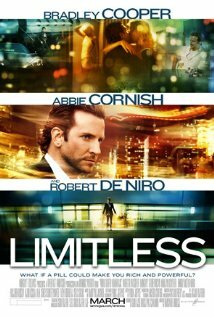 This is what Eddie Morra (alias Bradley Cooper) says in “Limitless”, the 2011 feature film by Neil Burger with Bradley Cooper, Abbie Cornish and Robert de Niro. I just watched it again for the fourth time and this movie, despite some aspects, remains one of my favourite movies of the recent years. “I was blind but now I see” is what “enhanced” Eddie says while under the effects of the NZT-48 experimental pill, the out-of-the-blue solution to his “writer’s block”. Although the movie is said to portray very well a bipolar disorder case (actually much better so I think than the “Silver Linings Playbook” movie does, also with Bradley Cooper and Robert de Niro by the way), my viewing angle on this movie will be on purpose more philosophical (which maybe was the book’s intent, but I will have to read it first) than psychological or sociological. I prefer to see in this movie the story of a regular man who is going through a quite standard existential quest of meaning, his soul searching experience, but maybe in an extreme way (which makes it of course much more interesting and entertaining). So I will not brand his “lows” medically as depressions and “highs” as manias; but simply call them lows and highs (and therefore fight the overdiagnosation and overmedication going on). Eddie is not sick. He is a writer. He has not medical issues. He has problems. All his problems start from his “writer’s block” (a classic bloggers’ problem I believe…), eating pizza one after the other; and trying to “not leave the room” in order to write the book of his life but without success. Then he is given an experimental pill, which he uses first for achieving his initial life goal, writing a book (in four days!). But then, the movie I think becomes very interesting. Now that his capacities are unlimited, is writing a book really the best he can do and the meaning of life? His new skills make him very attractive to women and to men (he understands the motives and needs of everybody now); make him rich (a 8,5 million dollar armoured penthouse) and he succeeds in everything he does; opens his own laboratory (to get unlimited supply of the drug), becomes senator, etc… And finally he gets the love of his life back. Interesting what a super intelligent being (which he became) can dream of even further (Limitless 2 is in the pipeline it seems): Cure for Cancer?, world revolution? (the later is actually hinted in the movie, “It’s about time that somebody shocked the free world and got the things done.”) Didn’t we all think that way, at least once? No need to be depressed, maniac or bipolar. It’s good movie not only because of the good story. It is a good movie because it contains all 4 ingredients: 1) a good story (and thousands of good quotes to prove that, see http://www.imdb.com/title/tt1219289/quotes), 2) a good cast (It is simply Bradley’s best performance to date, which is by the way also probably the hardest for an actor; switching from very high to very low so fast and so often, an “emotional rollercoaster” as Bradley says in the bonus interviews), 3) a good director (Neil Burger shot already a pretty good movie in 2006: “The Illusionist” with Edward Norton, Paul Giamatti and Jessica Biel) and 4) a great score . This movie will stay with us for a while. The movie tagline is “what if a pill could make you rich and powerful” but the real originality of the movie is in the way you actually get rich and powerful, a pill which boosts intelligence, energy and focus. Although the main idea of the plot, the concept of “we use only 20% percentage of our brains” seems to be a myth (http://en.wikipedia.org/wiki/10%25_of_brain_myth), this imaginary pill is still a nice storytelling tool enabling to study the effects on your life of being smarter and more focused. It “unlocks your potential” and as Vernon says in the movie “it works better if you are already smart” . Everything Eddie reads and sees is processed faster. The peripherals, the five senses, are the same but the processor is a thousand times more efficient. “I know what I needed to do and how to do it”: what if that would be the case every single minute in every single situation? “I see not one scenario but 50 scenario, that’s what it does”, it’s actually what smart chess players do. Smart people understand things faster, they undertand people faster, not only what people want but also what they need, and have healthier relationships, better family life, social life, professional life, etc… “Enhanced Eddie” understands everything; people, writing, economy, stocks, diplomacy, “math became useful”,… and he has the energy to transform this vision into action: first he cleans the flat, then borrows money, gets a new job, reads books, newspapers, learns languages,etc… without any effort. Clearly the moments when Bradley was on drug were the most entertaining. And despite the long part on drug addiction, some ridicule clichés about russian gangsters and the unsolved issue of the murdered girl, the movie is still a breath of fresh air in a sea of films coming from the same ideological mould. If you liked this movie, you will surely like the french film “99 Francs” by Jan Kounen with actor Jean Dujardin (who became famous worldwide after winning the oscar for “The Artist” in 2011) based on the novel of the same name by Frédéric Beigbeder. The plot is different. 99 Francs is a satire on the modern advertisement business, and its hero, a commercial ad designer, organises a revolt against the advertisment business. The protagonists are quite different. Eddie Murra is a much nicer character than Octave Parango (The scene when Eddie and Lindy split is simply one of the most beautiful and tender love scene of the recent years). Despite the differences; the same witty voice over, the presence of drugs (real in 99 francs) and the extremely dynamic shooting style of 99 francs will remind you of this inspirational “the world is mine” feeling of “Limitless”. “I was more focused and confident than any man alive”. “I wasn’t high, I wasn’t wired. I was just clear”.